Destroy all of the portals and the Goo Cave on all five lands. You must finish the game without ever having to restart at the first land. Odds are you will need to use one of the other save slots in order to accomplish this. 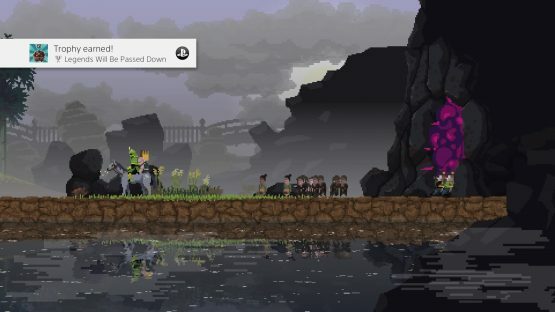 By far the most difficult trophy in the game. Successfully reclaim your crown 300 times after it has been knocked away by the Greed. Simply travel back and forth between lands in co-op mode. This trophy will only unlock for Player 1. Murder many trees! Yes, that means you may have to lose a vagrant camp or two. This is the first co-op trophy. Have Player 2 get their crown knocked off by the Greed. Player 1 can then stand beside Player 2 and spend coins to forge them a new crown. This trophy only unlocked for Player 1 during my game. Find one of the ornate gem chests hidden in the woods and collect the gems. There are Greed portals on every land. Once you have unlocked Squires, stand underneath the banner on one of the outermost walls and spend 4 coins to send out a squire and their men. You can spend those 4 coins for as many squires as are defending that side of the castle. They will head to the closest portal and fight until they destroy it or there are no men left. You can resend squires over and over until the portals are destroyed. Make sure you do this before the Tenth Day ends. Build and set sail for a new land by Day Five. Best accomplished on the first land as it requires the least amount of coins to build here. First, you’ll need gems to unlock steeds on each of the five lands. Once you unlock them, you will need to spend coins in order to ride them. 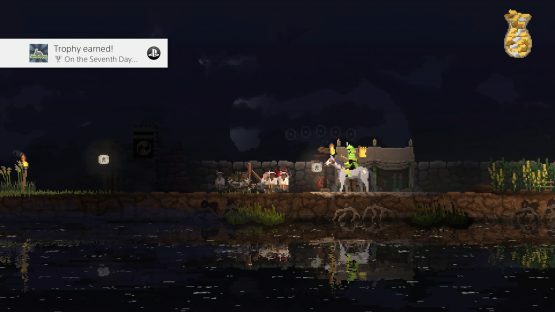 You only need to unlock 3 steeds for this trophy as your standard horse counts as one. 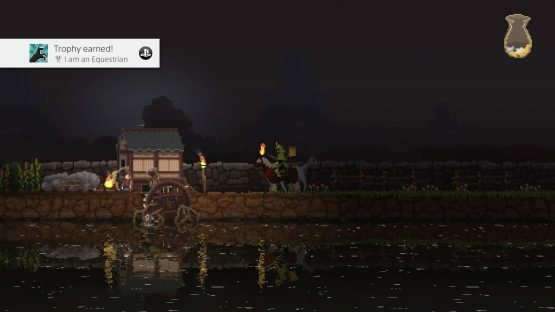 I was able to collect this trophy on the third land, as there are two unlockable mounts here plus a prettier variant of the standard horse that you can switch to. There are five hermits in total, one per land. Unlock one, bring them to the next land with you. They will wait in the town square until you build and launch the boat. Continue this with the next three lands and keep them safe every time. Once you have 4 hermits, launch the boat and travel to another land. There is a brief cutscene once your ruler boards the boat in which your other hermits can be seen running to join you. This one will take a lot of coins and villagers to achieve, so be patient. Odds are you won’t be able to do this until the fifth land so don’t feel the need to attempt it sooner. You also need to have unlocked the stone quarry (land 3) and iron mine (land 4). As you clear the land and push back the Greed, carefully build up your archer towers until they house four Archers. You do not need to use a Hermit to upgrade them further for this trophy to unlock. It’s not recommended that you build or fortify these during the winter period since you will not be earning coins during this time. When you enter the Goo Cave (located either to the left or right side on each land), make sure you escape the cave before the blast. This is most easily achieved on the first or second land. Return to a land that you haven’t been to in over 200 days and help them rebuild. Each land has a dock on one end, opposite the Goo Cave. 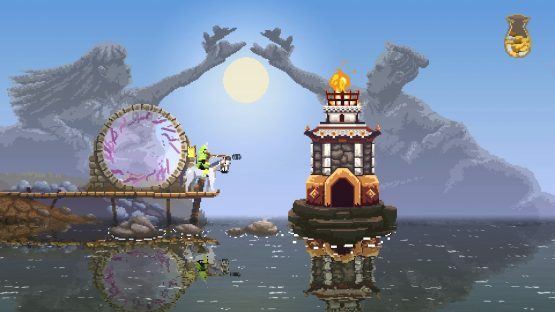 In order to build a lighthouse you will first need to destroy the Greed portal. Once you’ve done that, stand at the very edge of the dock and spend coins to build the lighthouse. You can upgrade it twice once you have unlocked the stone and iron mines. Repeat this process on all five lands. Murder every single tree on one land. Note that no vagrant hovels will spawn once you do so. Destroy all of the portals and the Goo Cave on one land. Destroy all of the portals and the Goo Cave on two lands. Destroy all of the portals and the Goo Cave on three lands. Destroy all of the portals and the Goo Cave on four lands. It is easiest to unlock this on lands you are travelling to via the boat as four Archers generally take positions on it as soon as it drops into the water. Once you reach land, spend the coins to open the town square, recruit the two vagrants you see hanging near the campfire, immediately spend the eight coins to fill up the Archer tool rack, then do a quick run on either side of the camp to locate the nearest vagrant hovel and recruit two more villagers. They should collect their bows as soon as they make it to the town square, so long as you haven’t created any other tools. This must be done before the sun rises on the Second Day. Once you land, run to the town square and DO NOT build walls on either side of the camp. Upgrade a total of three times (campfire, tents, wooden fortifications). This should run you 18 coins and unlock the spike wall immediately on either side of the town square for free. Wait until the third day on a new land to light the campfire. This is best done when coming to a new land with some of your subjects on the boat. You may need to drop a coin or two on either side at nightfall to help keep a few Greed from attacking since you have no walls for defense. Your Archers will kill bunnies that spawn in the tall grass beyond the walls of your town square. If there is no tall grass, you may need to send Builders to clear away trees that are close to your walls. The more tall grass, the better. The trick here is to attempt this on the first or second land. You’ll need to make sure you have several coins so you can drop some to keep the Greed from knocking off your crown. You can build the camp and walls but do not turn any villagers into Archers. Have your gold pouch so full that a single coin (or several) spill over. Once you have expanded your land enough to unlock the catapult, build it and let it reach the furthest wall. Now, return to the catapult workshop and stand by the arrow. Spend five coins to build a flame barrel. These will be the first barrels launched when the Greed attack. Keep your catapults stocked with these and eventually this trophy will unlock for you.